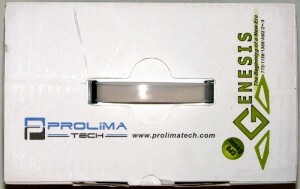 Next on my heatsink test system is a relatively new offering from Prolimatech, the Genesis. Instead of the usual vertical single or double stack tower style heatsink you normally see on the market, Prolimatech took a different approach with this heatsink that combines both the tower style and the laid over style of heatsink with two differently arrayed heatpipe stacks. We will be seeing if this unusual layout arrangement works well in cooling a modern system or if it’s more of a novelty item. 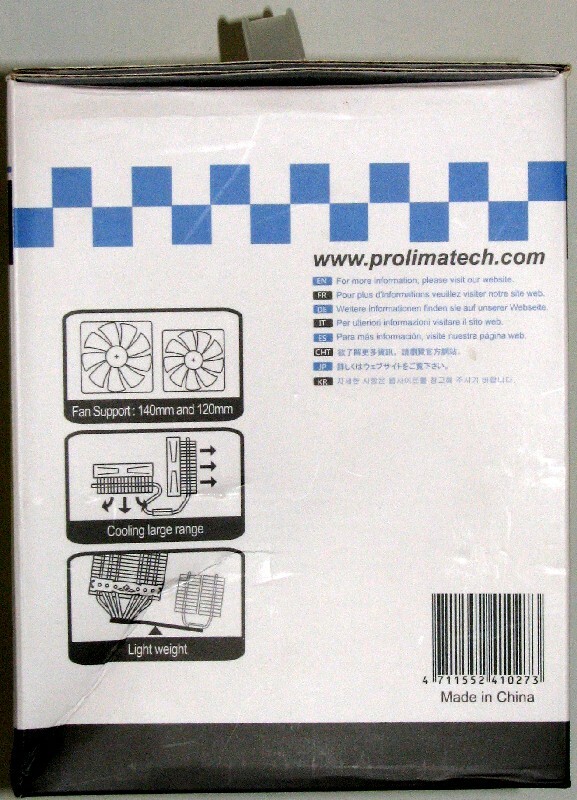 Prolimatech was founded in 2008 and since the formation of this company, has provided some quality cooling products for modern CPU and GPU cooling. I have already looked at the Megahalems Rev. A and Rev. B, as well as the Samuel 17 and found them to be competent coolers built to a high quality standard. Their fit and finish has been up with the best of the tier 1 offerings and while I didn’t find class-leading performance with them I did find their coolers to be very competent at doing the job. 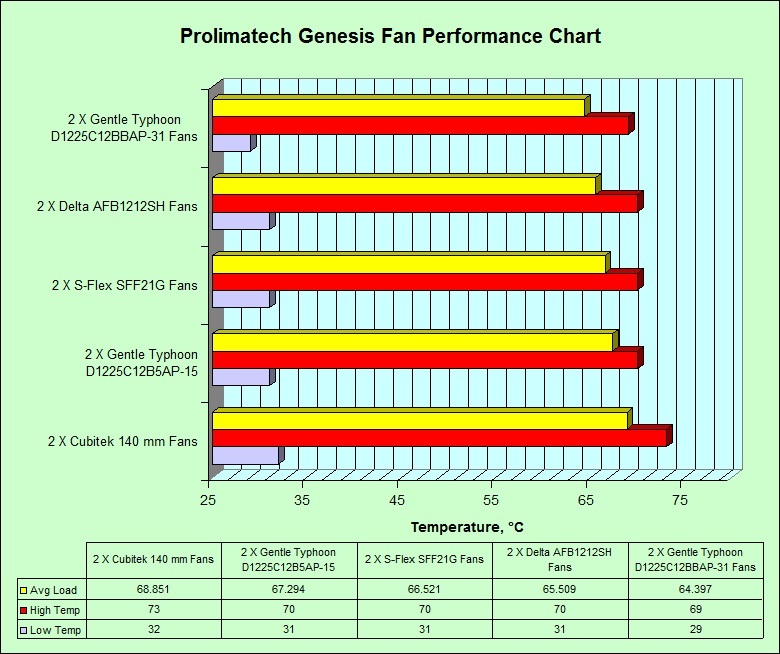 Today we will see if the Genesis keeps the high quality fit and finish and raises the bar in cooling performance. 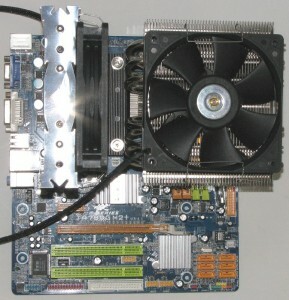 Takes both 12 and 14 cm fans for a maximum installation of 3 fans. Light weight at 800 grams (without fans) in the high end class. Intel and AMD platform supported. All mounting hardware is included. 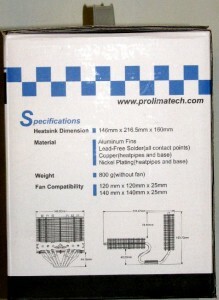 The specifications of this heatsink surely look like they could bring some very good performance to the table. And another welcome change from the Megahalems heatsinks I tested in the past is the addition of mounting adapters for both Intel and AMD systems. With the Megahalems you had to buy the AMD mounting bracket separately and I think that this should be a given for a heatsink that sells in the price range that the Genesis is going for. 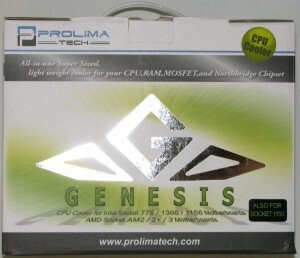 By the way, this sample wasn’t a heatsink sent to us by Prolimatech. I bought this one out of my pocket, since I was curious to see if the new layout arrangement gave good performance results. 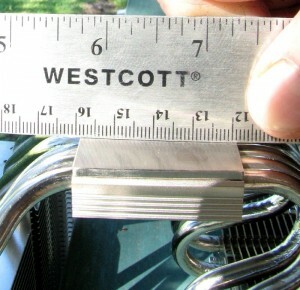 This heatsink has a measured mass of 788.6 grams and the fan clips have a mass of 4.5 grams, bringing the total measured mass of this heatsink to 793.1 grams, which is very close to Prolimatech’s stated mass measurement. Front and back of box. 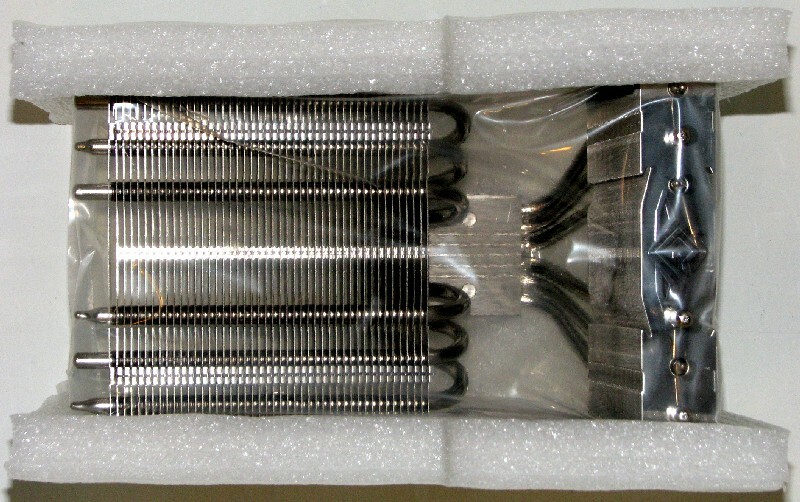 Once you open the box, you see a rectangular box in the top above the laid over heatpipe stack, that contains the mounting hardware. Once it it removed you see the heatsink itself securely held in place by plastic foam inserts. 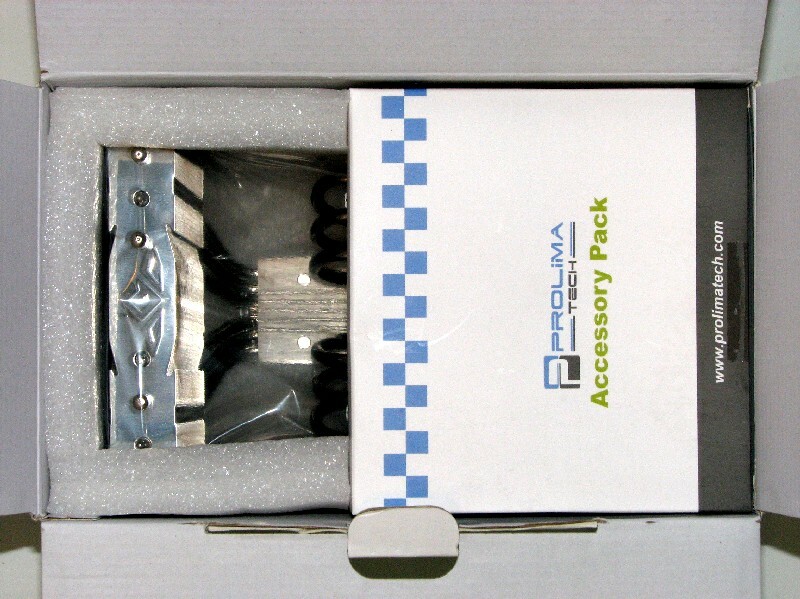 Prolimatech did a good job of packaging this heatsink inside the box, making damage to the heatsink during shipping very unlikely. Heatsink and foam removed from box. 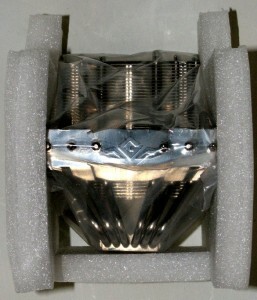 Once the heatsink is removed from the packaging, you are looking at a design that is unconventional, to say the least. 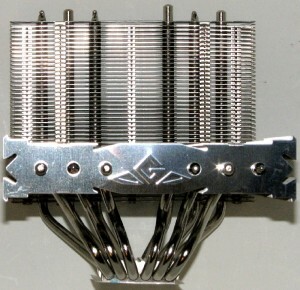 Prolimatech went with 6 heatpipes into two different fin stacks, but instead of both fin stacks rising vertically from the base, Prolimatech laid one of them over horizontally in relation to the base. With this design, you must use at least two cooling fans on it, since the fan mounted on the horizontal fin stack can’t blow air into the vertical fin stack. But, the horizontal fin stack let’s the air blown by it’s fan through the stack cool all the various motherboard components in that general area and also gives excellent air movement in the RAM slot area. It is also offset enough to give good clearance even for ram that has tall heatspreaders. The only disadvantage is that once the heatsink is installed, you can’t remove or install ram into their slots. Here are some pictures of this new heatsink design. 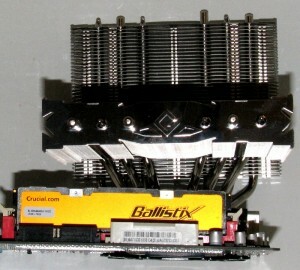 The base of this heatsink is finished in typical Prolimatech fashion. The finish itself is very nicely done and the base is bowed in one axis, just like they did with the Megahalems and Samuel 17. The bowed axis is across the six heatpipes and the base is flat going with the heatpipes. 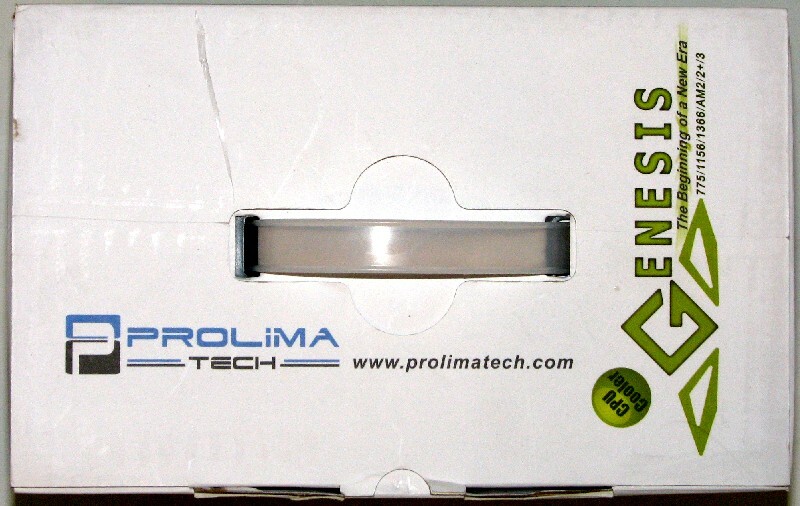 Prolimatech has never had any base finish problems I know of in the past and with the Genesis, they continue with a quality finish on their heatsink base. Base slightly bowed across the heatpipes. Base flat running with the heatpipes. 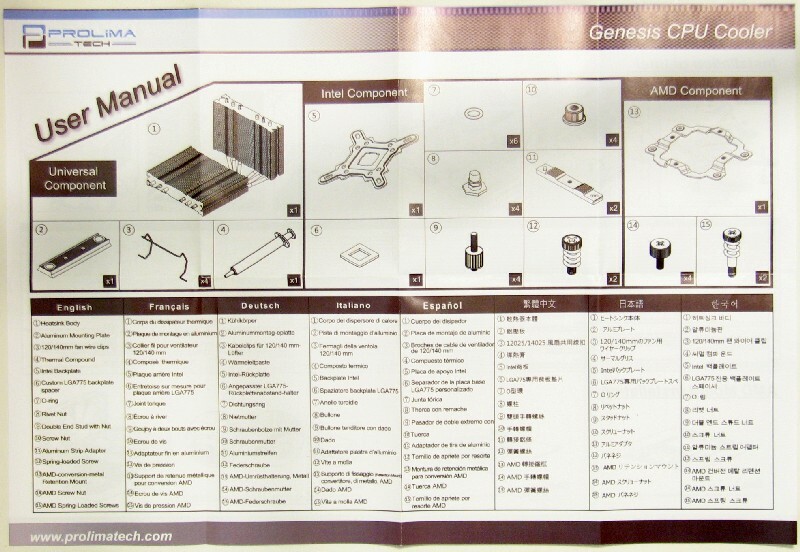 The mounting hardware included with the Genesis now includes mounting adapters for both Intel and AMD systems. The Samuel 17 included mounting adapters for both Intel and AMD, but their earlier Megahalems only included the Intel mounting system and if you wanted to use the Megahalems on your AM2 or AM3 system you had to spend additional money for the AMD mount. 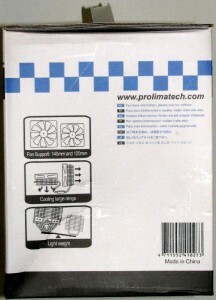 This is a very welcome addition by Prolimatech and is something that needs to be included with a heatsink selling in the price range as this one. Intel and AMD mounting hardware. 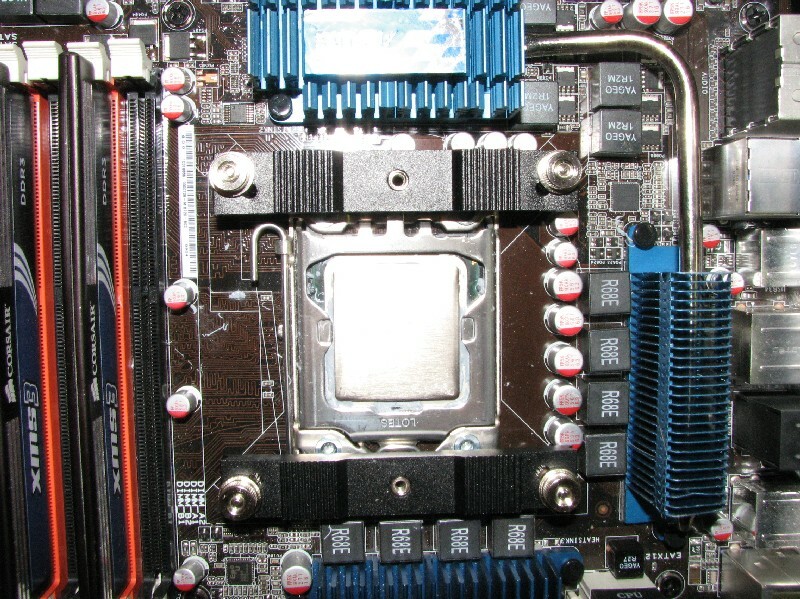 The Intel mounting system is the same as the one included with the Megahalems Rev. B, which is one of the best Intel mounts I’ve used. 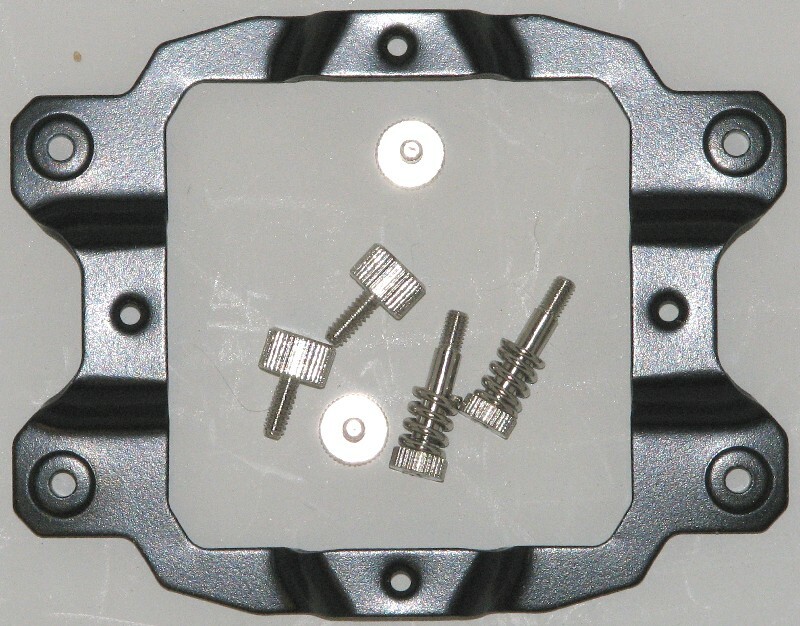 The backplate has slots that you set for the bolt pattern that your Intel motherboard uses and capture the threaded inserts to the backplate with some o-rings. 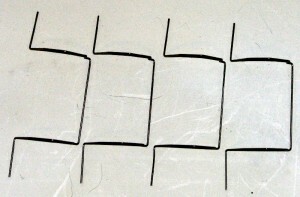 You then mount it to the board with the standoffs from the top side of the board and mount the rest of the bracket to them. 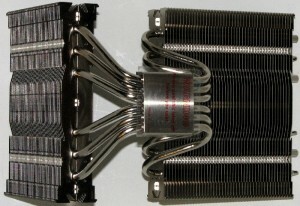 This heatsink uses the same crossbar to hold the heatsink down for both AMD and Intel. 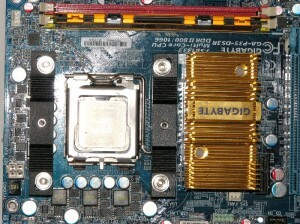 Intel mount on LGA775 board. 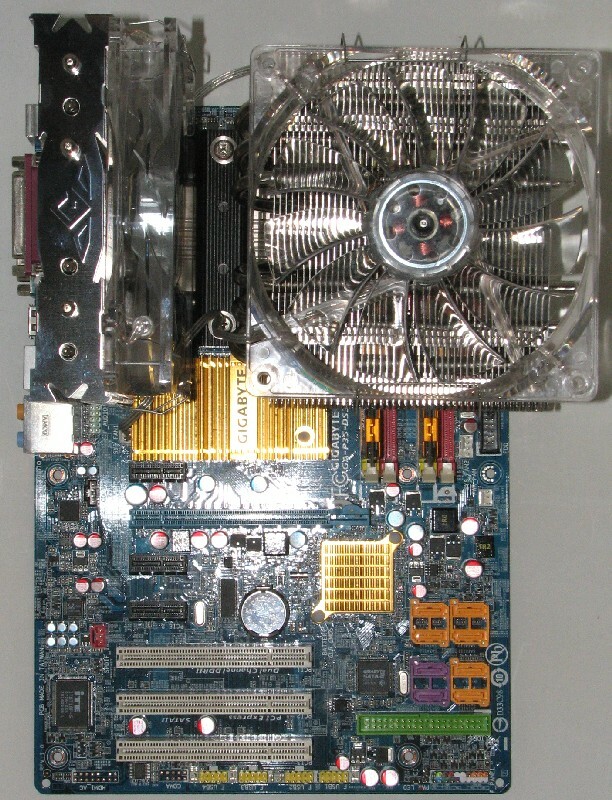 Mounted on LGA775 with no fans installed. 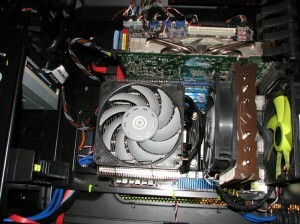 Mounted with 140 X 25 mm fans installed on LGA775. As you can see below, there is generous clearance between the laid over heatpipe stack and the ram. You should be able to run ram with tall heatspreaders with this heatsink with no problems. End view. Note generous ram clearance. 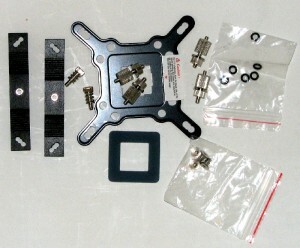 For AMD systems, Prolimatech has you use the backplate that came with your AM2 or AM3 motherboard. 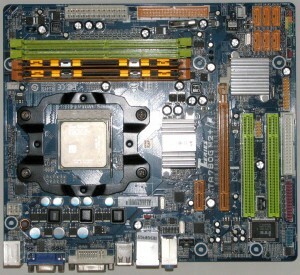 There is a metal mounting plate that you install on the front side of the motherboard that you sandwich the motherboard between it and the AMD backplate with four thumbscrews. Once it is installed, you can then mount the heatsink to the front mounting plate using the crossbar mount which is used for all mounting systems. 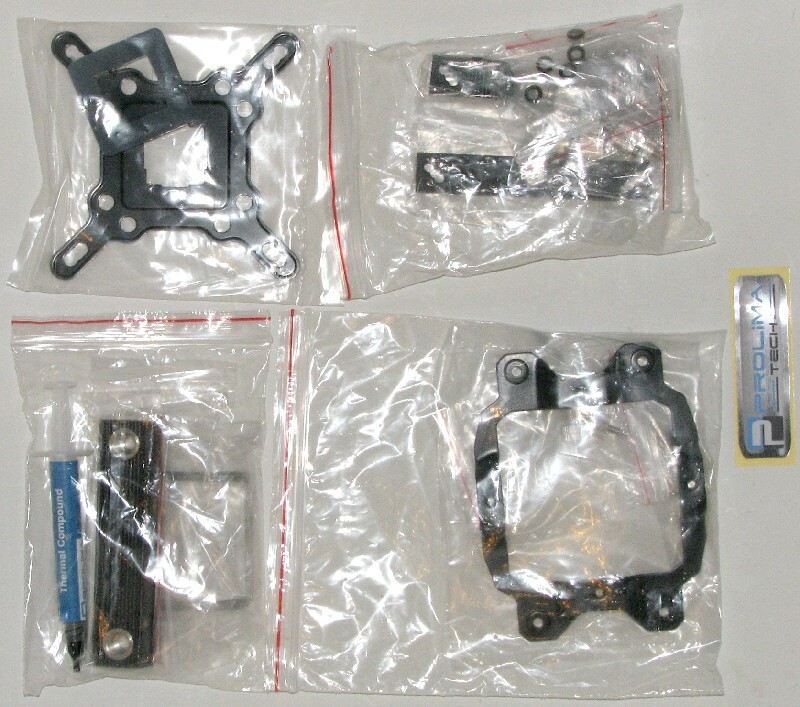 The front plate is also designed to compensate for the socket being laid out in north-south or east-west mounting bolt orientation so that you won’t have problems mounting this cooler on your AMD system. 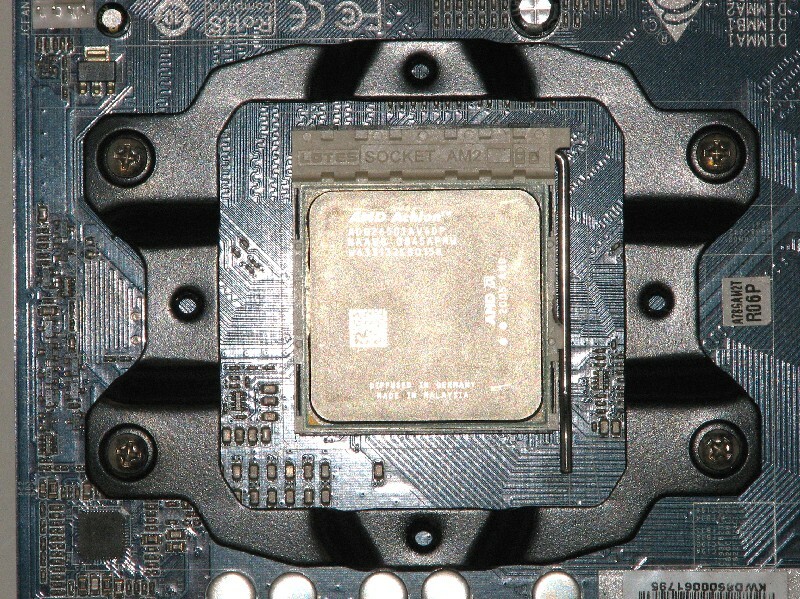 Since AMD uses a rectangular mounting bolt pattern, this is especially important with this heatsink since you have one heatpipe stack in a horizontal layout and would interfere with the video card or top of the case in a north-south heatsink installation layout. 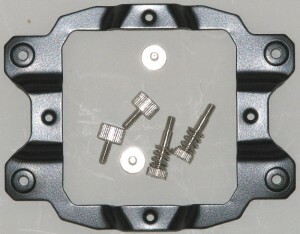 AMD mounting plate and screws. 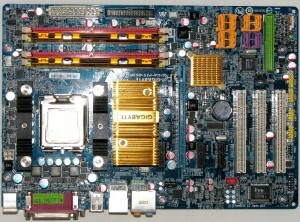 AMD mount installed on motherboard. 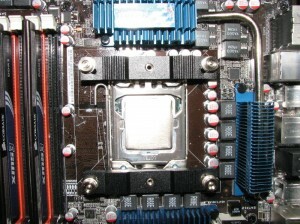 Closeup of AMD mounting bracket. 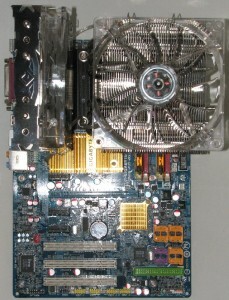 Mounted on an AM2 motherboard. Again, note the generous ram clearance with horizontal heatpipe stack. 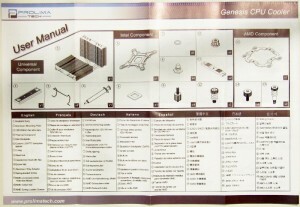 The instruction sheet for mounting the heatsinks is a simple one page foldout. On the front side is an exploded view of the heatsink and the included parts. 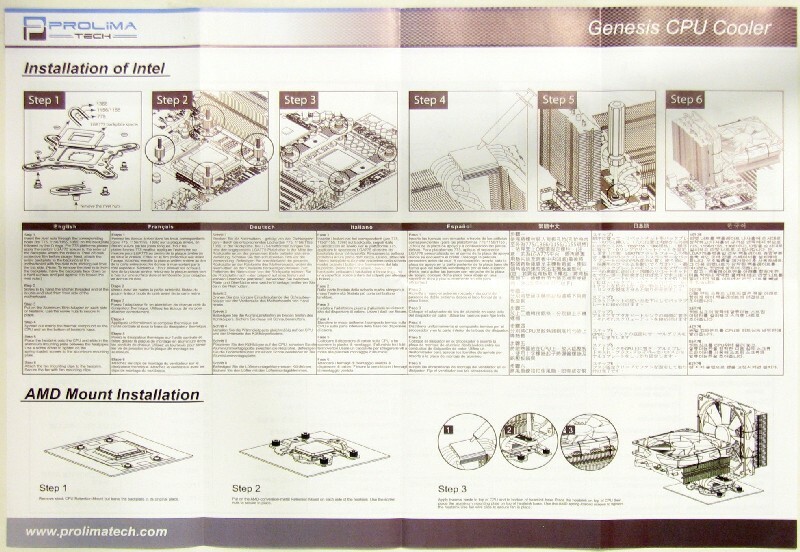 On the back side of the foldout are the mounting instructions for mounting on both Intel and AMD systems. No problems were encountered with mounting or using the instructions. The heatsink doesn’t come with any fans, so you will need to purchase some or have some handy to install this heatsink. 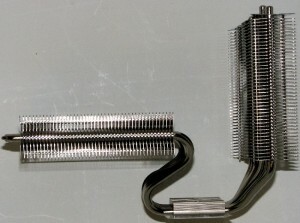 The fans are held onto the heatsink with four smallish clips that engage the sides of the heatpipe stacks and clip over the sides of the fans. They will clip either 120 x 25 mm or 140 x 25 mm fans to the heatpipe stacks. When new, they take a considerable amount of force to engage the outside lips of the fan frame, but do stretch a little bit after a few installations. Depending on the fan design, you have to be careful on placement on the fan frame lip to keep from interfering with the fan rotor blades. These fan clips will not work with fans thicker than 25-26 mm, so if you want to use a 32 or 38 mm thick fan you will be needing to rig up your own clipping system. 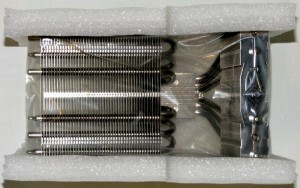 The heatsink also comes with a tube of thermal interface material too. 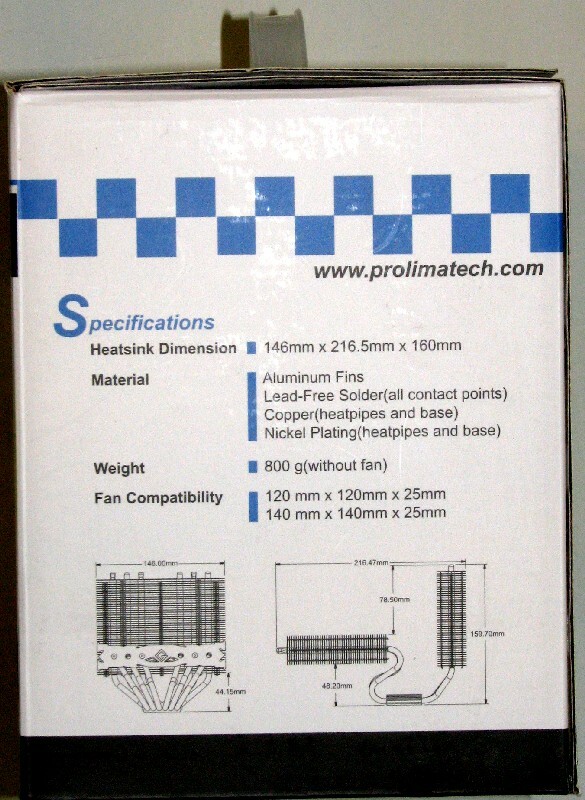 I have seen questions asked on various forums whether the TIM included with Prolimatech heatsinks is their acclaimed PK1 thermal interface material, so I fired off an email asking Prolimatech about this. They answered back that the included thermal interface material with the Genesis is not PK1, but rather a material with a bit lesser cooling performance. While the included TIM seems to be decent, I would have expected some of their highly rated PK1 to be shipped with a heatsink selling for what the Genesis is available at. Fan clips for the Genesis. 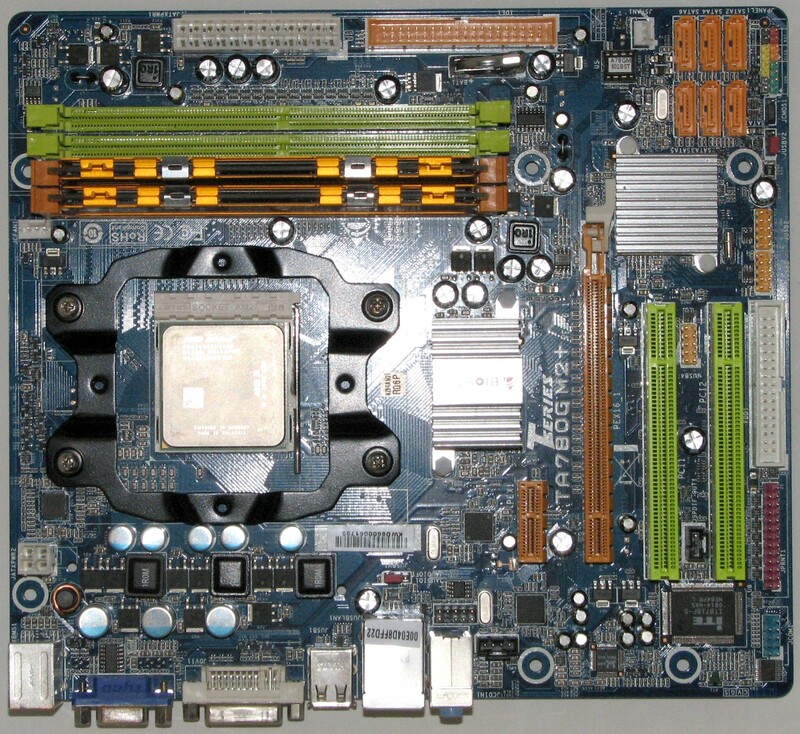 Installation on my LGA1366 test system was much the same as on the LGA775 board and no problems were encountered with interference with any of the various coolers on the board such as the northbridge cooler and VRM coolers. 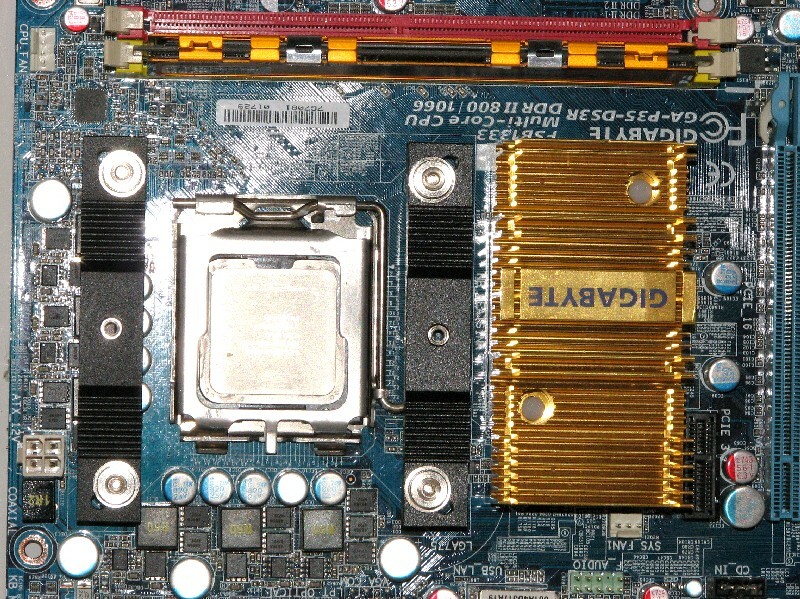 Intel mount on my P6T motherboard. 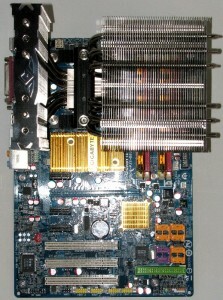 Mounted without fans on test system. Mounted with Gentle Typhoon fans on test system. I have used all the 120 x 25 mm fans in previous heatsink tests, but I also included some runs with some 140 x 25 mm fans too for this heatsink. The Cubitek fans were pulls from a case and not fans I bought for testing. I asked the case manufacturer for some specs, but they never obliged by giving me some CFM, dBA, and static pressure numbers for the fans. The RPM range of the fan is derived from direct reading of the RPM sensor by a fan controller and the wattage rating is derived from the fan ampere rating. Since I have done the testing on this heatsink, I have ordered some 140 x 25 mm Yate Loon fans in Low and Medium speed varieties for testing with, since it seems like more and more heatsinks are being designed to accept 140 mm fans. Case – In Win Dragon Rider. The 220 mm side door fan has been shifted downward to give clearance for tall heatsinks. No other alterations have been made to this case. Processor – Intel Core i7 930, overclocked to 4000 MHz @ 1.304 v.
Arctic Cooling MX2 thermal paste was used for testing as I have found it to give good consistent results with no appreciable break in and it applies and cleans up easily. All testing was done with the side door fastened in place on the case. 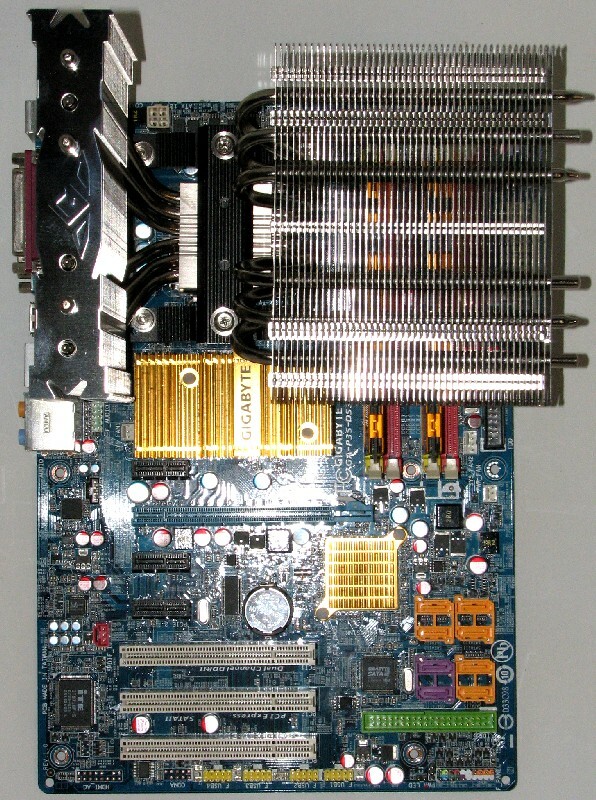 All energy saving features of the motherboard and processor were turned off to keep it from down clocking the processor speed and vcore. All fan control functions were turned off in bios to keep the fans at maximum speed. For processor temperature monitoring purposes, I am using Real Temp 3.46, with logging enabled at 2 second intervals. For room temperature monitoring, I am using a Fluke Model 52-2 and using a “K” type thermocouple that is inserted into the case front where the front intake fan is mounted. 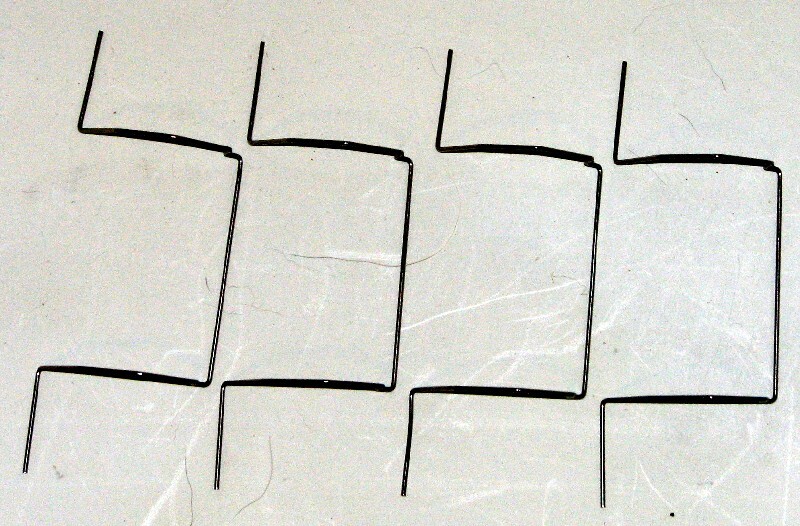 The Fluke records the maximum, minimum and average temps during the run at 1 second intervals. Temperatures in my computer room were maintained as close as possible to around an 18 °C average during the run, as measured at the lower front intake fan by the Fluke. At the end of the test run, I logged the maximum, minimum and average temperature. The maximum and minimum temps in the charts are given as recorded by Real Temp, but the average temperatures have been adjusted to a constant 18 °C as derived from the Fluke average temps. For loading the CPU, I used Prime95 version 25.8 using in-place large FFT’s and ran it for 30 minutes to stabilize temps. After 30 minutes, I would exit Prime95 and let the CPU idle for at least 10 minutes. The highest recorded temperature from the hottest core for each run was then recorded off of the Real Temp log, the lowest temperature on any core was recorded and the average temperature on the hottest core was calculated during the load portion of each run and adjusted to a constant 18 °C. Each fan configuration was tested with three remounts of the heatsink, and the lowest average temperature run recorded, to minimize any problems between mount to mount installations. This performance my friends is simply fantastic! These are the lowest numbers I’ve seen since I started testing with my test system in its present setup for a heatpipe type cooler! 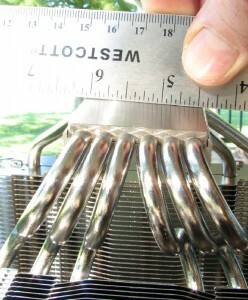 The heatsink only shows minor scaling as the CFM and static pressure ramp up. 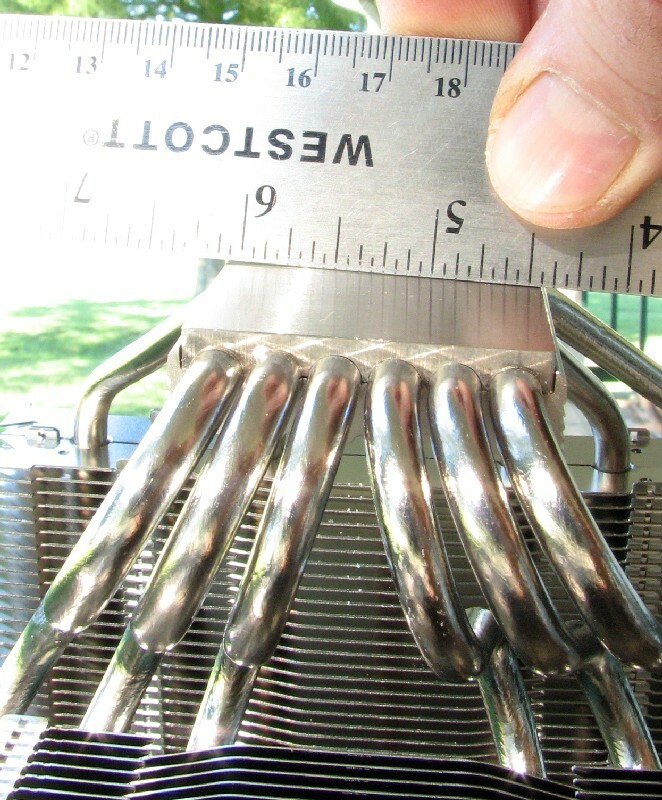 This shows that Prolimatech has done a good job getting maximum performance from this heatsink with quieter, lower CFM and static pressure fans such as one would choose for an everyday use system. Something like a TRUE Rev. C or a Havik 140 might be a better choice for maximum overclocking for benching a system, but for normal use most people will want great performance with quieter fans and this heatsink really delivers. A pair of AP-15 Gentle Typhoon fans are pretty darn quiet and almost unnoticeable with a case sealed up, but you don’t lose much in the way of cooling power compared to noisier, high CFM fans. 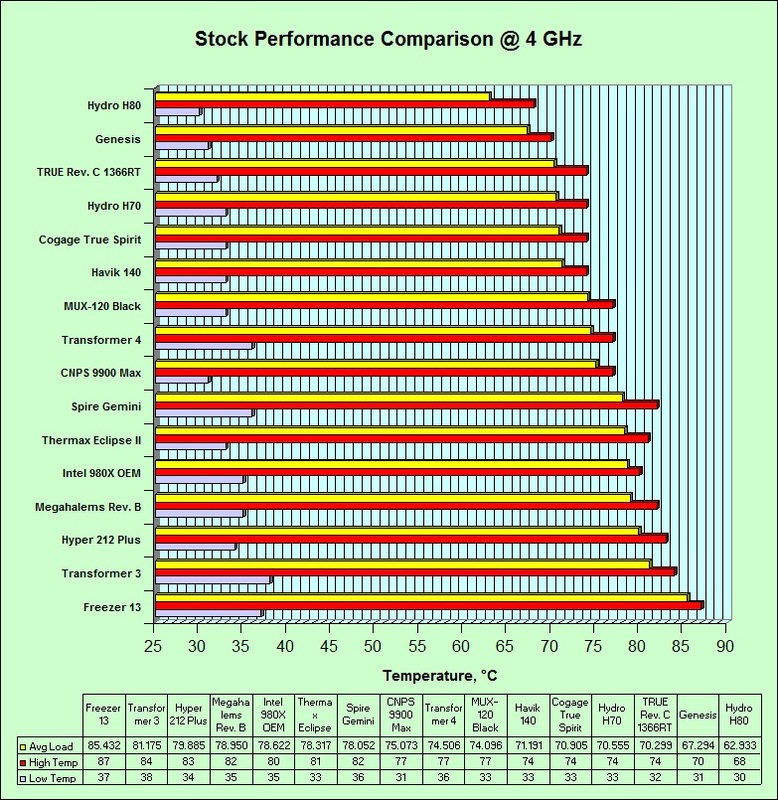 Next is a chart comparing this heatsink to others I have tested on my present test platform. I chose to use the Gentle Typhoon AP-15 fans as the “default” fans for this heatsink, since it doesn’t come with fans from Prolimatech. As you can see from the above graph, the only cooler that actually beats it in cooling performance on my test system is the Corsair Hydro Series H80, which is a noisier and slightly more expensive cooling solution. It even handily beats my personal favorite for quiet cooling, the TRUE Rev. 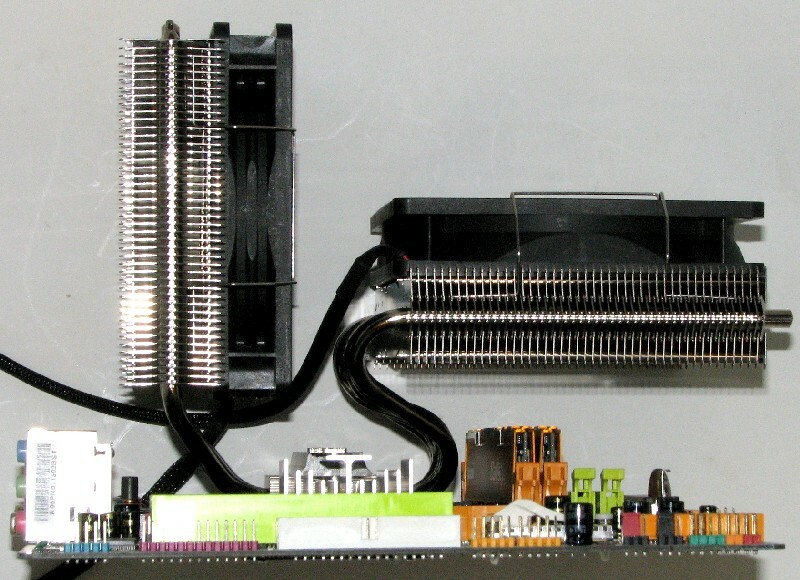 C. Prolimatech has done some seriously good engineering with this cooler. What we are seeing here is an outstanding performer in cooling. It easily handles the 200+ watt heatload my overclocked i7 930 throws at it and asks for more. 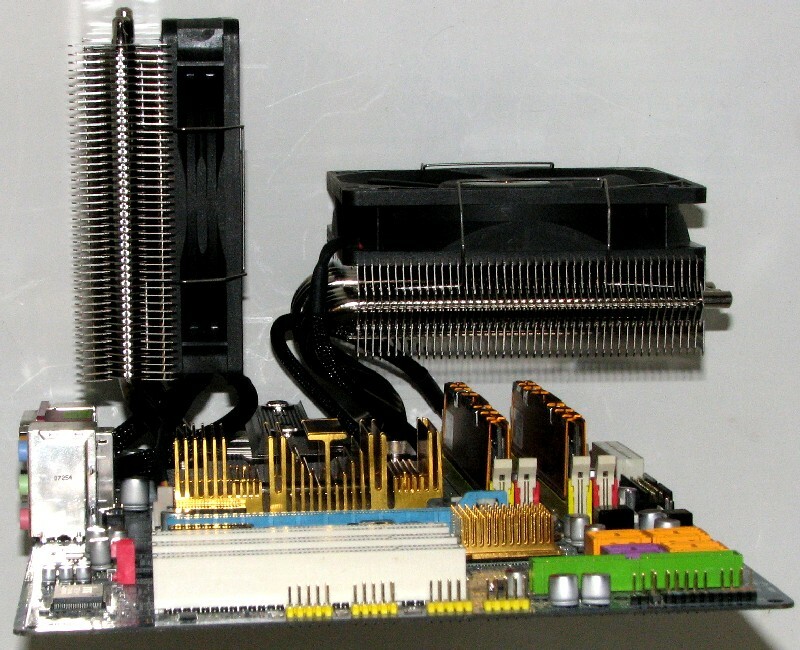 The mounting system for both Intel and AMD systems are both top notch and take a back seat to nobody as far as securely and easily mounting this heatsink to your motherboard. The only drawbacks I found with the heatsink at all are the fact that with the laid over heatpipe stack overhanging the ram slots you can’t remove or add ram with the heatsink installed and the fan clips can be a little bit tricky to position correctly. But most people won’t have a reason to be adding or removing ram on their system a lot and the fan clips are easy enough to position where you don’t have interference with fan blades once you have messed with them a bit. As to the cost of this superb performer, well it’s not cheap. 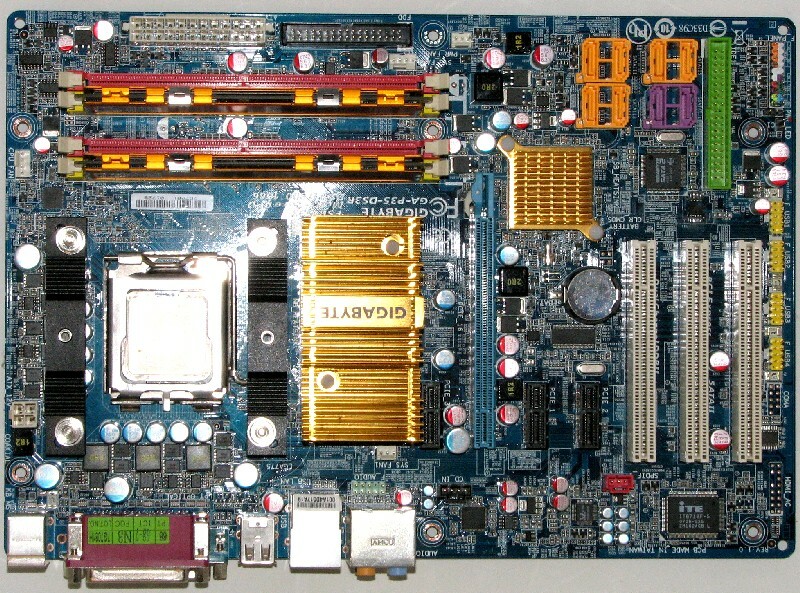 I bought the one for this review from Sidewinder Computer Systems, Inc. for $69.95 plus shipping. I have been dealing with Sidewinder for almost a decade now and Gary has always taken care of me. Doing a quick search on Google also shows this price to be the best out there for this heatsink too. Taking into account the price of this heatsink, plus a couple of quiet fans and you can find better price/performance offerings. But if you are looking at quiet performance first and aren’t too worried about the price, this heatsink needs to be on your short list to look at. 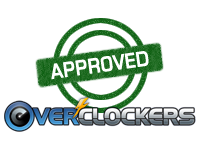 With that said, the Prolimatech Genesis easily earns itself an Overclockers Approved rating! I hope that you have enjoyed reading this review of a very good cooler. I did enjoy testing this one, as there were no hidden surprises found when mounting and testing it and while it is on the expensive side, it also justifies itself with superb performance. And I will be back very soon with some more review. I have several more heatsinks to review soon. 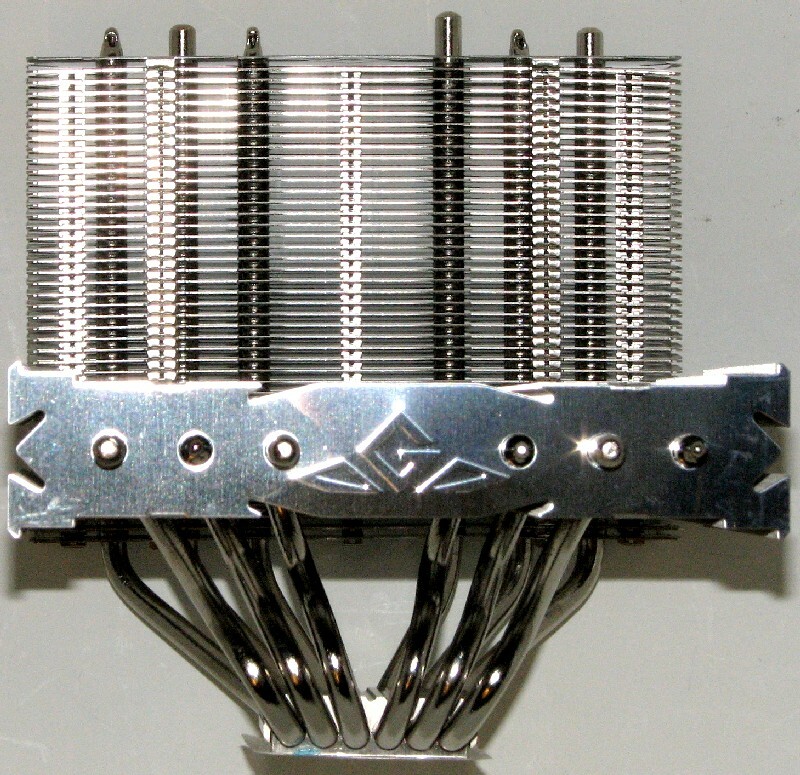 That is an impressive performing and looking heatsink. That remind me of an older Thermalright one, for some reason. Another great looking article Mudd! Great article again mud. But why didn't you use Noctua DH-14 for some comparison? Just wanna know how good this new heatsink is when compared to one of the best air cooler (or the best should I say)? Ok, not exactly like it, but similar! Wow, that looks like it would beat the noctua. My noctua performs about the same as my old h70. The reason I haven't compared it to the NH-D14 is that I don't own one any more. I sold it shortly after reviewing it the first time with my old test setup. I do have a couple of other top performing Tier 1 coolers I will review as I get a chance though, that would be comparable to the Noctua in performance. And looking at it's performance as compared to the TRUE Rev. 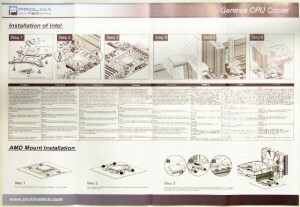 C, the Genesis should compare very favorably to the Noctua. When I did my original testing in my first formal review, the TRUE Rev. C came in at a very close second to the NH-D14. 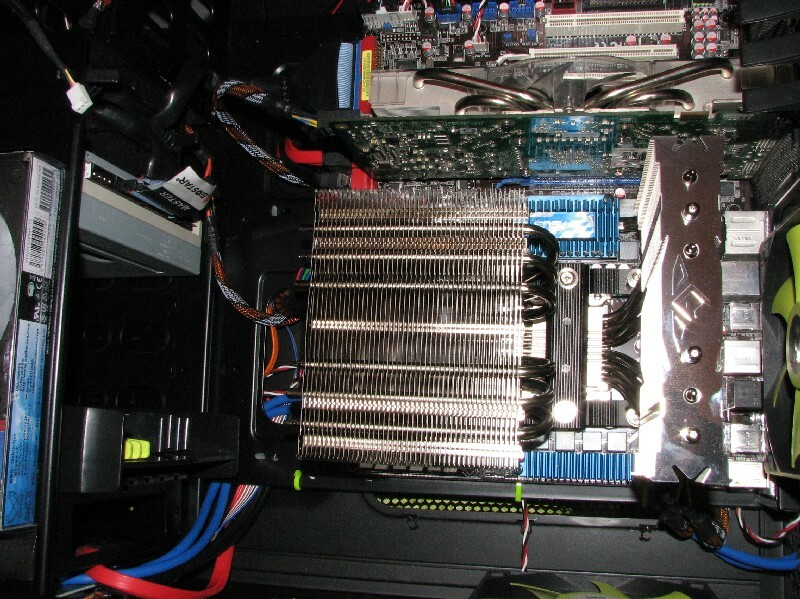 Great review and very interesting to see a non-standard tower cooler performing so well. Something went wrong when they tested the megahalems Rev B. no way is it that far behind an H80. And you are wrong there too. I have tested 3 different Megahalems; 1 original model and 2 different Rev. B models. And all 3 were inferior to the others I tested too. The 2 Rev. B models were tested on the very same platform and very same setup as the H80 and the others I still had that I retested on the same setup as I tested the H80 with. The Megahalems is a decent, but not top performing heatsink. Basically, it's starting to show it's age, even more so than the TRUE Rev. C.
Hey you finally got to it. Yay! I am surprised it performed next to the h80. Yeah, this one is a definite home run by Prolimatech. Lol, that's why it's in my gaming red it. Wearing a headset, who cares about noise unless it's loud enough to trigger voice activation in General who cares?